EA Solar Panels – energyaustralia.com.au/solarsaver – Quality Solar Systems from $2,399 We are the Solar Power Experts! The head of the World Meteorological Organization says there is no standstill in global warming, which is on course to continue for generations to come. The planet is continuing to warm, with implications for generations ahead, and temperatures are set to rise far into the future, the World Meteorological Organization (WMO) reports. Global surface temperatures relative to 1951-1980. The Niño index is based on sea surface temperature in the Niño 3.4 area (5N-5S, 120-170W) in the eastern tropical Pacific for 1951-1980 base period. Green triangles mark times of volcanic eruptions that produced an extensive stratospheric aerosol layer. It says 2013 was among the ten warmest years since modern records began in 1850, equalling 2007 as the sixth warmest year, with a global land and ocean surface temperature 0.50°C above the 1961–1990 average and 0.03°C higher than the most recent 2001–2010 average. Thirteen of the 14 warmest years on record have all occurred in this century. The warmest years on record are 2010 and 2005, with global temperatures about 0.55 °C above the long-term average, followed by 1998, which also had an exceptionally strong El Niño event. El Niño events (which intensify warming) and cooling La Niñas are major drivers of natural climate variability. Neither occurred during 2013, which was warmer than 2011 or 2012, when La Niña exerted its cooling influence. 2013 was among the four warmest neutral years recorded, when neither El Niño nor La Niña affected temperatures. The rate of warming is not uniform but the underlying trend is undeniable. Given the record amounts of greenhouse gases in our atmosphere, global temperatures will continue to rise for generations to come. Our action – or inaction – to curb emissions of carbon dioxide and other heat-trapping gases will shape the state of our planet for our children, grandchildren and great-grandchildren. Each decade is warmer than the previous one. There is global variability from year to year. You have to look at the longer period. If you do that, then the message is beyond any doubt…Despite the fact that there was no El Niño in 2013, it was still the sixth warmest year. This is significant. 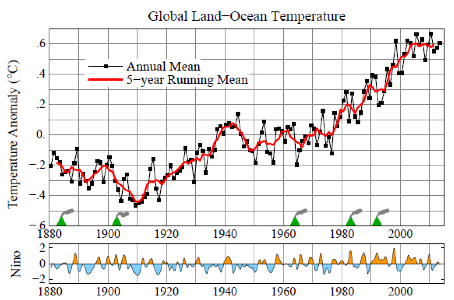 The WMO says surface temperature is just part of a much wider picture of climate change. “More than 90% of the excess heat being caused by human activities is being absorbed by the ocean”, it says. It has released the temperature data in advance of its full Statement on the Status of the Climate in 2013, to be published in March. This will give more details of regional temperatures and other indicators. In contrast with 2012, when the US in particular experienced record high annual temperatures, the warmth in 2013 was most extreme in Australia, which had its hottest year on record. WMO’s global temperature analysis is based mainly on three independent and complementary datasets. One is maintained by two UK centres, the Met Office Hadley Centre and the Climatic Research Unit at the University of East Anglia. The other two are based in the US: NOAA’s National Climatic Data Center, and the Goddard Institute for Space Studies (GISS), operated by NASA. Each dataset uses slightly different methods of calculation and so each gave 2013 a different temperature ranking, but they were consistent on the year-by-year changes and the longer warming trends globally. WMO also uses reanalysis-based data from the European Centre for Medium-Range Weather Forecasts (ECMWF), which showed annual global land and ocean temperature to be the fourth highest on record.